For young adventurers (adults will love it too!) 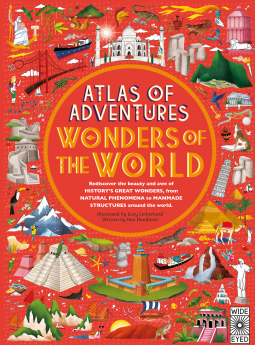 Atlas of Adventures/Wonders of the World – Joyce's mystery and fiction book reviews with some non-fiction too! I enjoyed visiting places like the Eiffel Tower, Angkor Wat, Yosemite, Mount Everest and the Forbidden City. I also spent time in places that I did not already know including Burj Khalifa and Pantanal. Plus for additional fun, the end of the book has a section with details of illustrations that children can hunt for in the text. I highly recommend this one. It will encourage children to dream of travel and adventure! Many thanks to NetGalley and Quarto for this enjoyable trip. The opinions are my own. From the ancient landscapes of Australia to the tropical islands of the Pacific, there’s beauty and wonder to be found in abundance. 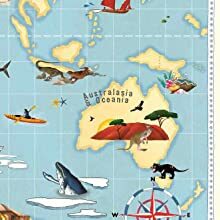 The monolithic Uluru begins your journey, then perhaps to the Great Barrier Reef, the heart-shaped island of Tasmania, the hot springs of New Zealand, the lush paradise of Bora Bora…it’s a region of pristine wonders, waiting for you. In some ways the whole of Antarctica is a great wonder! 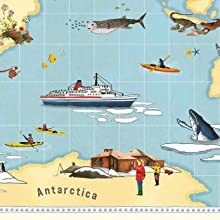 A frozen continent covered in snow and ice, hardy cold-loving animals like seals and penguins, glaciers edging inches each year toward the sea, pristine blue icebergs floating on the ocean…You’ll need your warmest clothes, but jump on a cruise ship and head all the way south.